Get the inside scoop on weird (and get your name added to the ranks of 'Fringe division'!) with the official companion volume to the hit sci-fi TV show Fringe, coming soon from Insight Editions. 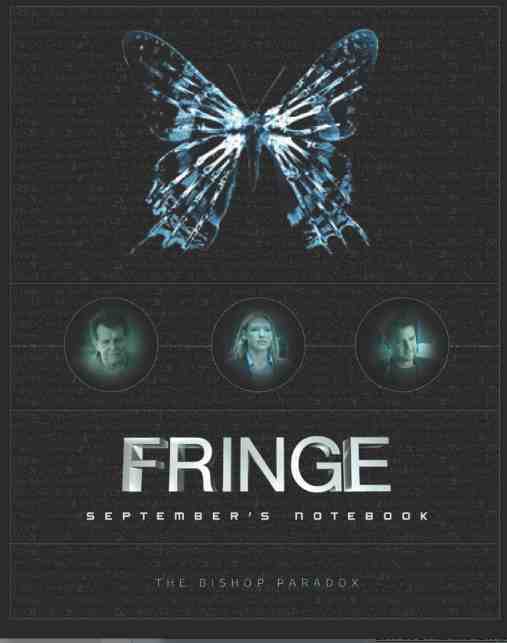 Insight has been producing some very cool stuff lately and this one is no exception- Fringe: September's Notebook puts together in print all the data that the "otherworldly observer" September has collected on the show's main characters's across the series overall story arch. Also pretty cool, is that the book serves as an end cap to the show, which concludes this Winter on Fox. And if the promise of more background info doesn't do it for you- maybe the associated contest will, because fans can actually get their names listed in September's Notebook as members of the FBI's Fringe division. With Fringe: September's Notebook, sneak inside FOX network's most captivating science-fiction thriller, from the perspective of "September," an otherworldly Observer on the periphery of the series' compelling story.Clandestinely collecting data on series characters Walter Bishop, Peter Bishop, Olivia Dunham and their ever-changing universe, this mind-blowing 192-page tell-all gathers all of September's data and is the perfect keepsake following the show's final season coming this winter. Entering its fifth and final season this fall (airing Fridays at 9/8c on FOX), Fringe is a series that follows main characters Olivia Dunham (Anna Torv), Peter Bishop (Joshua Jackson), and Walter Bishop (John Noble) as members of a Boston-based FBI branch called the "Fringe Division" for its use of "fringe" science and investigative techniques. With the help of fellow agents and allies Phillip Broyles (Lance Reddick), Nina Sharp (Blair Brown), Astrid Farnsworth (Jasika Nicole), Charlie Franics (Kirk Acevedo), Lincoln Lee (Seth Gabel) and John Scott (Mark Valley), the FBI's Fringe Division investigates a series of mysterious and chilling occurrences revealing the existence of a parallel universe. The Observer September chronicles the main characters' personal stories and elements of the show's mythology including as the Fringe Division, Massive Dynamic, the Machine, the alternate universe "Over There," and the Amber timeline. A revelation for fans and super fans alike, this book includes exclusive photos, concept art, and reveals quirks and little-known facts about each character, insight into fringe science, and much more. Design features throughout the book build upon the many symbols and codes woven into the show's fabric, uncovering truths never before revealed. Returning for its final season premiere on September 28, this critically acclaimed series has a rabid and devoted fan base, and the Fringe phenomenon has spawned two six-part comic book series and an alternate reality game. Fringe: September's Notebook, is the first comprehensive guide to the Fringe mythology. It's a must-have companion following the show's exciting conclusion this winter. "From the pilot's edge-of-your-seat opening scene to the literal end of the universe in the most recent season finale, Fringe has been epic, compelling storytelling at its best," says Lisa Gregorian, Chief Marketing Officer, Warner Bros. Television Group. "This book is exactly what every fan could ask for - a companion guide to the many worlds of Fringe and the characters we'll follow to the ends of the Earth ... and beyond." "It goes without saying that Fringe fans are the heart of the show," adds J.H. Wyman, one of the show's executive producers. "We would not be here telling the final chapter of this story without them. As a way of acknowledging their amazing support and dedication, we'd like to give them the opportunity to truly become a part of the Fringe canon. Interested fans can enter a sweepstakes* for a chance to see their names as a part of the Fringe Division. Rest assured, this is only the beginning of many opportunities that will involve our fans this season." 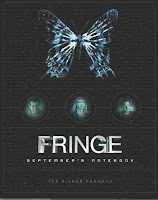 Created by J.J. Abrams, Alex Kurtzman & Roberto Orci, Fringe is produced by Bad Robot Productions in association with Warner Bros. Television. The series' creative team over five seasons has included Abrams, J.H. Wyman, Jeff Pinkner, Bryan Burk, Joe Chappelle, Kurtzman, Orci and Akiva Goldsman. Fringe is easily one of the 'smartest' shows on TV and personally I'm sad to see it go after only five seasons. It should be very interesting to see what the creative team has cooked up for the bookend year though. If you'd like a little more info about the book (scheduled to rip through time and space and onto bookstore shelves this February) or like to through your hat in the ring for that contest, head on over to Insight Editions' website by clicking here.